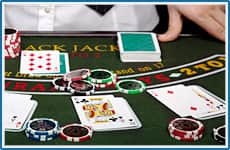 A classic casino card game that has been around in one form or another for centuries, the object of blackjack is to draw a hand whose value is higher than that of the dealer’s, but without going over 21. If you go over 21, you “bust” and lose. In blackjack, the cards 2 through 10 are worth their face value, and all face cards – Jack, Queen, King, etc – are worth 10 as well. An ace is worth either 1 or 11. A hand with an ace that is counted as 11 is called a “soft” hand, so an ace and a five, for example, is called a “soft 16.” A hand with an ace counting as 1 is called a “hard” hand. After placing your real money bet you will receive two cards face up. The dealer also receives a card face up. (Check out some of the other variations of blackjack where the dealer may receive two cards face up.) If your two cards make a total of 21 (e.g. A-10, A-K), you immediately have “blackjack” and the dealer will pay you odds of 3/2 on your bet. However, if the dealer also has blackjack you will tie – or ‘push’ – the hand, and your original stake will ride on the next hand. OK, so getting blackjack right at the start is the ideal scenario, but what if you haven’t hit that magic 3/2 jackpot? Well, if you haven’t made blackjack, you have a series of options. First, you can ‘stand’, which is electing to take no more cards. Play will then move on to the next player – if any – and then the dealer. You can elect to ‘hit’, which is to take another card to make your total closer to 21. You can carry on hitting until you go bust or you choose to stand. You can also, if you are dealt two cards the same, opt to ‘split’; that is to split the cards, double your bet, and play the hands separately. Players can ‘double down’ – or double the amount of your bet, taking just one more card, then stand. What makes blackjack so fun for the player is that the dealer plays too! Well, kinda. He certainly has some stock moves he or she has to pull when he takes part. If his cards total 16 or less, the dealer MUST hit. If he has 18 or more, he MUST stand. If he’s dealt a ‘hard 17′ – that is, a card worth 10 and a 7 – he MUST stand. However, if the dealer has a ‘soft 17′ – an ace and a 6, for example, which can count as 7 or 17 – he must hit. 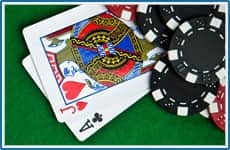 Rules vary from game to game online, however, so make sure you read the rules at your favorite online casino to see where you stand (pardon the pun). Let’s say the dealer is dealt an ace face-up. Here you have the option to take ‘insurance’ – that is, paying another real money bet (equal to half your original bet) in the advent that the dealer’s second card will make him blackjack. If the dealer does make blackjack you’ll win 2/1 on the insurance bet. If he doesn’t hit that magic blackjack, however, you’ll lose your cash. Welcome Offer of up to 200 GBP! Can I make money at online casino? What casino game has the best odds? The greatest casino games are here!